This article assumes that you have you have some basic knowledge of Microsoft Windows, NetSuite CRM data fields, standard internet browser functionality and InsideView data fields. Back up your CRM data before following the steps in this article. You can upload data into NetSuite CRM in multiple ways. The steps to upload data may differ based on the procedure you choose to follow. If you are unable to upload data even after following the steps below, then send an email to services@insideview.com for assistance. 1 Log in Log into NetSuite. 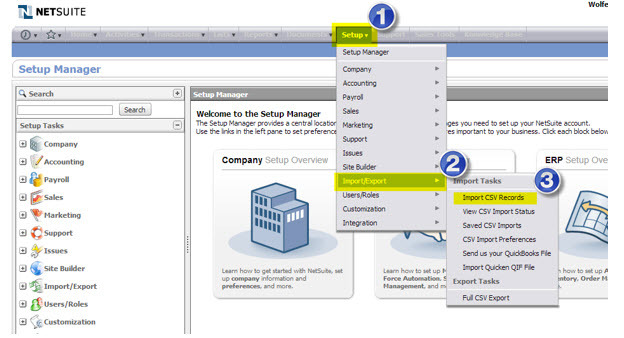 2 Go to the Import CSV Records window Click on Setup > Import CSV Records. 3 Get started Click on Get Started on Import Assistant pop-up. 4 Select the settings Select Relationships from the Import Type drop-down menu and Customers Only from the Record Type drop-down menu. 5 Select the Character Encoding options Select Character Encoding to be Western (Windows 1252) for Windows. If you are using Apple’s Mac, select Unicode (UTF-8) or Western (Mac Roman) based on the format in which you have saved your enriched file. 6 Select the radio button Select the radio button for the file that you want to upload and click Select. 7 Select the enriched file Browse and select the enriched file provided by InsideView and Click Next. 8 Import the data To import data, select Add if you are adding New Accounts or select Update if you are enriching existing data. If required choose among Advanced Options as per your needs. 9 Map data fields To map data fields, drag and drop fields from Left (fields from file just uploaded) and Right (NetSuite custom fields) to Center and click Next. Status and Individual are mandatory fields for data mapping. By default, the Status is selected as Closed-Won. Change accordingly as per your company best practices. We recommend leaving the Individual selection as No, because InsideView's enriched data will always be for accounts (organizations, rather than persons). In case any of your accounts is an individual person, create an additional column on the enriched file and mark it as Yes or No accordingly. 10 Enter a name for the mapping Enter a name for this mapping. In the future, you can use the same data mapping to import InsideView’s enriched file into NetSuite. Once you enter a name, an import job will be created. 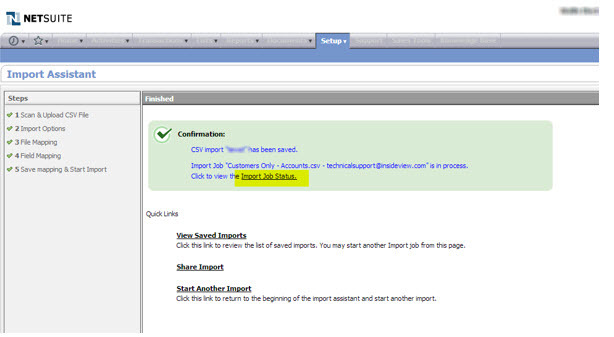 11 View the import status To view the status of the job, click the Import Job Status link. You or your group will receive a notification upon job completion. 12 Open and review job notification Click the CSV response link to download the file and review job success. Check to make sure that there are no errors. If you notice any errors fix them and repeat the steps to upload data.